On Saturday 21 September, at Mighty Mighty in Wellington, Dame Fiona Kidman declared “The Life and Loves of Lena Gaunt, and your mysterious gorgeous character, well and truly launched”. Here’s a taste of how the evening progressed. You can find more photos online here. The velvet curtain backdrop of the Mighty matched the novel’s cover, displayed gloriously by Alex and Todd on the Unity Books table. Performances by Erika Grant on cello — Lena’s first love — and and Nell Thomas on theremin — the instrument Lena becomes famous for playing — provided a beautiful, fitting sonic ambience, and were the perfect illustration of what’s central in the novel: the strange and fascinating sound and action of playing the theremin. As the room filled, Erika and Nell played on, drawing people in. Signalling the start of formalities, Craig Stevens welcomed everyone to Mighty and read a short message from Lena consultant editor, Georgia Richter — who sent warm wishes from everyone at Fremantle Press — before introducing Dame Fiona Kidman. I love the sensuous ebb and flow of this work. The language is beautiful, the sense of music a powerful onward movement throughout the story. Tracy dares to go where many a writer might retreat, Lena’s story full of raw power. This is writing that is not afraid. Fremantle Press have made a lovely production job of this book. As one would expect, for it’s a prestigious Australian publisher, that only publishes the best. Some of their writers include Joan London, Elizabeth Jolley and Tim Winton. Tracy Farr is a fine name to add to such a list. I began by saying that this is a book I’d love to have written. What more can one writer say to another? Tracy, it’s been a long road…I hope it feels worth the journey, because I certainly believe it has. I declare The Life and Loves of Lena Gaunt, and your mysterious gorgeous character, well and truly launched. I responded with thanks to Fiona, and to so many others. Then, inspired by Erika and Nell’s performances, I read two pieces from Lena. In the first, set in 1926 Malacca, the teenage Lena plays cello. The second piece I read was from the novel’s first chapter, when Lena — an old woman — walks on stage to play the theremin. Then I welcomed Erika and Nell back to the stage to play more beautiful music, and urged people to come up close to watch Nell play theremin, if they hadn’t already, to see how strange and beautiful it was, to get a sense of what it was about the theremin that had intrigued me enough to make me base a novel around it. Alex and Todd from Unity set me up in the signing booth — a fabulous leather cocktail bar with reading lamp — and I signed books for a heartwarmingly long queue of people. Thanks, beyond words, to Fiona Kidman, Craig Stevens, and Fremantle Press; to Sally Thomson and all at Mighty Mighty; to Alex, Todd and Dylan from Unity Books Wellington; to Erika Grant and Nell Thomas for music; to Matt Evans (Matt Evans Photography) who took all the photographs on this page; and to everyone who was there at Mighty Mighty, or sent their best wishes, or was there in spirit, for supporting me and Lena. 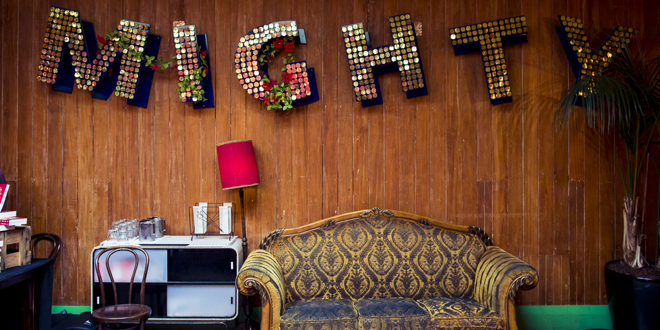 Mighty Mighty closed down just a few months after Lena Gaunt launched there. Much missed.